Wing Commander Donald Teale Saville DSO, DFC joined the Royal Australian Air Force in 1927. From 1932 until 1939 he flew and tested private aircraft, was a flying instructor and then a Captain-pilot with Australian National Airways. In 1936, at the age of 36 years, he volunteered for the RAF whilst on holiday in England. Because of his age he was posted to the Ferry Pool Service and eventually became its Commanding Officer. In 1941 he dropped rank from Squadron Leader to Flight Lieutenant to join Bomber Command, and in December of that year joined No 458 RAAF Squadron flying Wellington’s as a Flight Commander. In 1942 he was appointed to command another Wellington squadron, No 104, at Kabrit in Egypt. He was awarded the DFC for daring operations whilst flying from Malta against enemy airfields and ports. In March 1943 he took command of No 218 Squadron at Downham Market flying somewhat elderly Short Stirlings and at a time of intolerable losses. In July 1943 he went missing on the first mass bombing raid on Hamburg. He made the supreme sacrifice by holding his burning aircraft steady while four of his crew escaped by parachute. He was known affectionately as 'The Mad Aussie' and was reputed to have flown 10,000 flying hours. 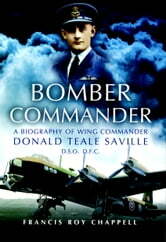 He was fifteen or so years older than most of his aircrews and was probably the oldest pilot in Bomber Command. At the time of his loss he was in was on his third tour of operations. This is the story of a man who carried leadership by example and was renowned as an exceptionally skilled, daring and confident aviator.